1) Introduce one carefully chosen organic superfood into your existing diet each week. Incorporating just one powerful superfood will immediately boost your vitamin and mineral intake, without the need for dramatic changes to your current eating habits. 2) Replace unhealthy products with super food alternatives. For example, swap refined sugars and artificial sweeteners for natural super food sweeteners such as stevia and lucuma. Or use fragrant coconut oil instead of your usual cooking oil for frying, stir-frying and roasting. You can even remove fattening dairy products from your diet by switching to hemp or almond milk. And, you needn’t go without your cocoa fix when cutting out processed chocolate bars - these can be exchanged for tempting raw chocolate products instead. In fact, you can easily replace all of your favourite confectionary with deliciously sweet dried super fruits such as goji berries, mulberries and Incan berries. Lastly, we recommend that you eliminate processed breakfast cereals altogether. A recent survey of the nutritional content of 50 UK breakfast cereals, conducted by independent consumer watchdog Which?, revealed that 32 out of the 50 were high in sugar, and that 12 out of the 14 cereals (86%) specifically aimed at children contained excessive levels of added sugar. Replace these with crunchy home made trail mixes (made from nuts, seeds and dried fruits) or nutrient dense super food smoothies that will keep you and the kids going until lunchtime. You don’t need to take out a second mortgage to purchase a comprehensive range of versatile super foods. Indeed, there’s a vast selection of cost effective raw, organic super foods that won’t cause the price of your weekly shop to rocket. There are a number of other ways that your family can enjoy super food benefits on a budget. For example, buy fresh super food products when in season – they’re not only cheaper, they’re also at their absolute best. 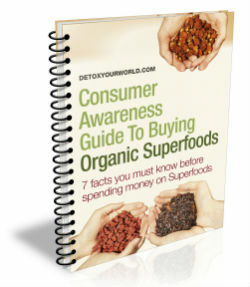 Try purchasing your super food products loose and you’ll avoid paying for expensive packaging too. And keep an eye out for the ‘reduced’ aisle in your local supermarket or the special offers on your favourite super food web shop. These give you access to cheap super foods that are still fresh enough to prepare delicious soups and nutritious smoothies.